Trusting Your Gut: No Bellyaching! | My Bento Box Life: Out of the Box, Into Life! I married for the right reasons; love, companionship, growing together and a new life. I just graduated from college where I met my husband. Although he had been married twice before, I felt we could make a go of it. I believed that if I loved him with all of my heart, we could get through anything. That, of course, is more of fairy tales (not being cynical). In all actuality, we were together to learn several Soul Lessons, but that’s for another post. When the reality that the man I married wasn’t the man I needed to grow with, I had to learn a new way to navigate through my decisions. Ironically, the more I followed my intuition and made choices that reflected this, the more volatile he became. I was learning to empower myself, and he felt threatened. My gut became my Guide. Usually when my mind was quiet, while driving or in the shower, this inkling or small voice would enter. My body would respond with a strong tingle actually in my gut! I became more calm in my choices and in my daily life. I also stopped reacting so quickly and internalized my feelings first. Feelings first, think second as the Sages say. … the more volatile he became. My intuition safely guided me out of the marriage, and I was so grateful that I was able to feel it, sense it telling me to listen. I finally believed after my divorce, life would get easier. It didn’t.- no surprise there! In fact, I found myself in a new relationship where my trust in my intuition was nearly destroyed! Why did this happen? Didn’t I just learn how to trust my gut? Well, like in any lesson in life, in order for you to truly learn the lesson, practice makes perfect. Throughout this four-year relationship, my gut was constantly tested. There were three distinct times looking back that I should have left him and saved myself from much pain. However, there was also something telling me I had to see it through to learn what I wasn’t understanding about myself. I was lucky that my intuition was still a physical sensation then, but I was also having disturbing dreams that showed me his duplicity. Yes, he was having a completely separate life hidden to me, and my gut knew it. It wasn’t until I actually discovered evidence of his lies and secret life, that I knew of every moment my intuition was correct. The reason my intuition was almost destroyed was when I would ask him of his transgressions, he would deny it most convincingly. He was very skilful at deceit. To my delight, once I started trusting myself and cornering him, he became more and more paranoid! I told him it was my gut when he questioned how I knew. We see this in movies where the actress questions her man, yet stops and doesn’t question why she asked in the first place. Her gut told her to. Most recently, I had to face a friend about my hesitance in creating a company with him. He dropped into my life shortly after the last relationship ended. This new gentleman and I hit it off, and we realized we had a lot in common. He was interested in getting back involved with film and thought we could collaborate on a screenplay. This was a dream for me, since I had always wanted to learn screenwriting. The carrot was dropped! Did you notice how soon that happened after the last relationship? Yes, I was being tested, and I didn’t even know it! We began to collaborate, and I was learning so much about the film industry. However, once we started to talk about the schematics, he became increasingly insistent that I must move with him to continue the projects we were writing. I was willing to do whatever it took to learn this industry, however I was not interested in him romantically. It was hard to tell him that we were not meant for anything more than just collaboration. My gut had told me early on we had two very different Life Lessons to learn from this, and though his lessons were more obvious to me, mine were hidden. 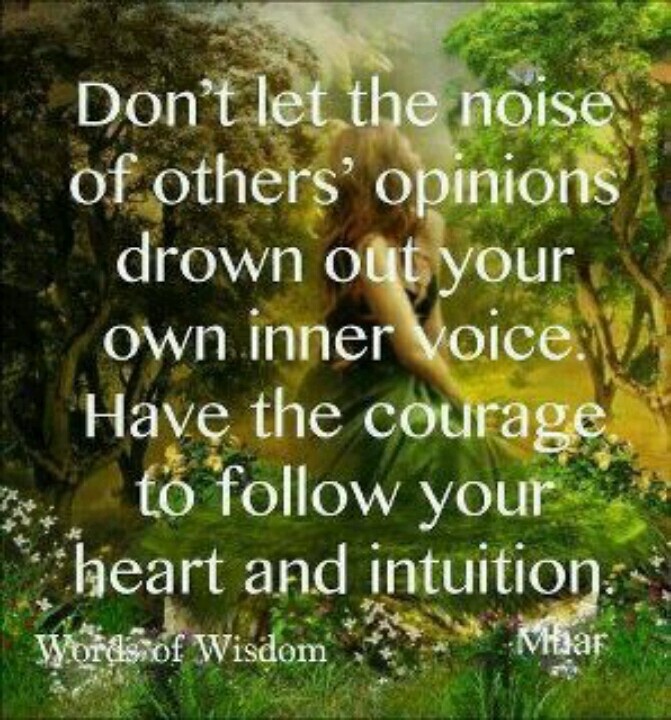 I just had to follow my gut and know it would lead me to where I was supposed to go. My intuition at this point was not giving me the physical response as it did before. It was more of a small voice in my head. It felt more natural and calm. When he started to persist that I must do things his way, I felt uneasy. I was now moving into feeling my responses than thinking about them; a true test of Intuition versus Logic. My voice said we were to be a business venture and that was it. He wanted more. But this was what I dreamed of doing, right? Wasn’t he my only path to learn film? Well, my blessed intuition had spoken to me the entire time, and I told him this. He became increasingly emotional and unstable. This was my indicator that I was hitting home. My gut was telling me that no matter what I was to learn from him, I was completely capable of creating my path and dreams, and not to rely on one person to fulfill them. He was hurt when I closed the deal. He had his own lessons to learn from this, but I was so grateful for this practice. I realized then that a sense of peace will overtake you when you are following your gut. When you resist, feelings of distress, unrest and self-doubt will overcome you. I wish him luck on his journey and grateful it happened. I could still work with him on film, however now it will be my decision, not coercion. There are many ways you can connect with your intuition. Meditation is just a start. There are many books on this as well. However, I ask that you find the path that speaks to you. Your gut will tell you what is right for you! Want more of this, follow this link!